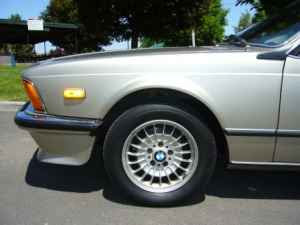 Although introduced in 1978, here in the US we didn't get the 635CSi version of the E24 until 1985. Quite a few came in through the gray market however, and this is one of those cars. 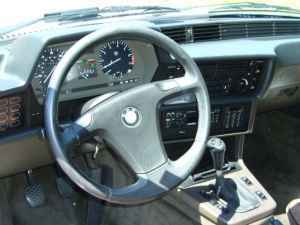 The European 635CSi engine put out 215 HP and came with a close ratio 5 speed transmission. (A 3 speed automatic was optional). 60 MPH came in about 7.5 seconds. Top speed was limited to just under 140 MPH. The European version of E24 also looked a lot better than what we got here. The most noticeable difference was the lack of the huge 5 MPH bumpers that were mandated by US law at the time. Those bumpers not only looked bad, they added about 300lbs of weight to the car, which did nothing for performance or fuel economy. This is an odd ad. The car looks great in the pictures, but the seller writes quite a bit about the 3 sets of wheels the car has and nothing about the condition of the body. What he does say is that he's spent quite a bit of money recently on brake work and some minor mechanical repairs. If the body is as good in person as it looks in the picture and if it's mechanically sound, the $3000.00 asking price is very reasonable for this car. It's a car you could drive everyday and bring to shows on the weekend. Located in Shadle, WA, click here to see the Craigslist ad.